It’s the time of year for reflecting back and giving thanks to all the positive in our lives. This weekend is Thanksgiving in the US and families will be getting together to share in good times (and good food!). ToonUps is getting into the holiday spirit with a preview of the December release of the new Facebook game called A Better World. And guess what? I had a chance to try it out myself this past weekend! 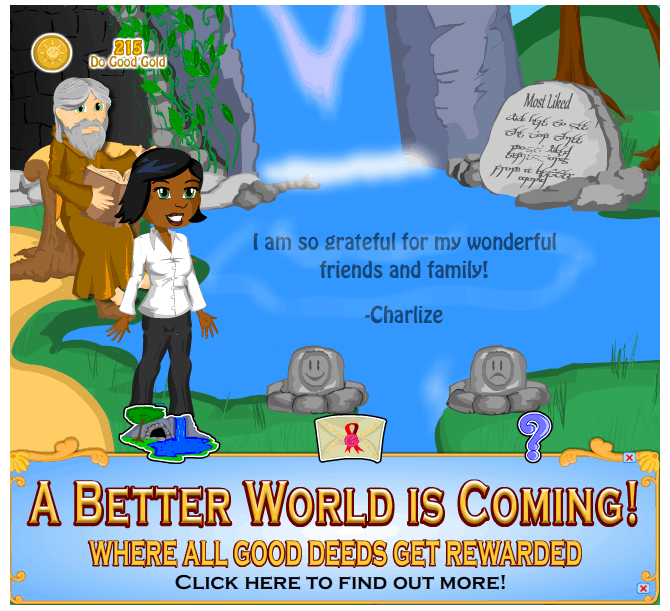 The motto of the game is “Where All Good Deeds Get Rewarded” and after trying out the Giving Thanks App, I can see that’s true. There’s so much negative in the world already that it’s refreshing to be able to partake in something that honours the good in life. I’d rather remember the good than the bad. To start, I created my own avatar. This part I had fun some fun with trying out different hair styles and colours and various outfits. You can even put on make up which I thought was pretty cool! Of course, I got my girl all decked out. The first spot I checked out is the Gratitude Grotto which is located in front of a waterfall. I clicked the older gentleman with the beard and the golden robe and a pop box came up and asked me, “What Are You Grateful For?” I then can type in whatever I like. I am grateful for many things including my daughters, my fiance, my home, my friends, my readers…Each time you tell what you are grateful for you earn points! You can have it posted to your Facebook wall if you like. If you don’t wish to share, you just uncheck the little box and it won’t post there. Gently rolling down the screen you will see what other people are grateful for. I can click the rocks in front to say whether I agree or disagree. One rock has a smiley face and the other a frown. You earn points each time you click. The other spot is the Positive Post which is inside of a post office with slots for everyone’s mail. You click on the postal worker and it asks you if you want to write something nice about a friend or read your Positive Posts. I had the sweetest post from Christine who thanked me for the Facebook Like You Back meme that we do each Wednesday. It made me smile. It’s nice to hear good things instead of criticism. I also sent some Positive Posts to my fellow friends on A Better World. I think this is just wonderful and everyone deserves a pat on the back and being told they are appreciated. Each time you send one you earn Do-Good Gold! So far I like what I am seeing with the Giving Thanks App and I am excited to play A Better World when its released next month. Then I will be able to decorate my home and visit my friends homes, play more games, collect magical and mysterious items or send them to friends! Can’t wait! Visit A Better World Facebook page to learn more! I am participating in the ToonUps Facebook App Campaign by Global Influence. I received a gift card as a thank you for my participation. The opinions on this blog are my own.